The work of artist Loran Speck, this tapestry "Sunflower with Persian Rug" shows a still life scene of sumptuous sunflowers. The use of light is masterful in this piece by Speck and shows the shape of the petals of the sunflower beautifully in a rich golden light. His still life works have this hallmark of wonderful use of color and composition. Here the sunflowers are in a vase on an alcove near a Persian rug, with a sunflower fallen off onto the ledge. It is a beautiful still life of sunflowers by Speck. 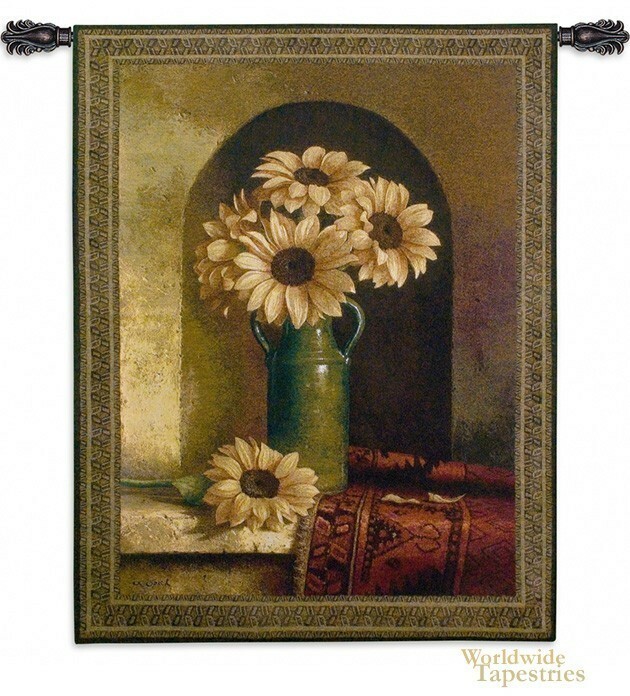 This still life tapestry "Sunflower with Persian Rug" is backed with a lining and has a tunnel for easy hanging. Note: Tapestry rod and tassels (where pictured) are not included in price.